Fitnate® Digital Timer Switch is a must-have home supply for all families. 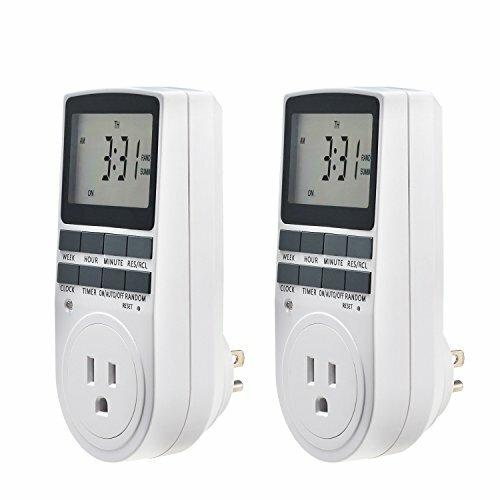 Set your timer at home or in garden. Have your phones or other electronic devices scheduled to charge in case overcharging. It also helps saving energy. When you are not at home, you can schedule the lights to turn on and off when you are not at home so as to keep potential thieves away. It has up to 10 ON/OFF programs in a 7-day period to meet your needs. With a built-in Ni-MH battery, you don't need to worry when it is out of power. It is extremely easy to use. All you need to do is plug it into a power outlet, then choose the setting you desire. It will definitely make your life much easier and safer.